Every year some of Devon and Cornwall's sixth form students are involved in collisions. In 2016 (the most recently available statistics from the Dept for Transport) 1,792 people lost their lives on Britain's roads and a staggering 24,101 were seriously injured (Source:Reported road casualties in Great Britain 2016). Over the past five years young drivers in Devon and Cornwall have been involved in over 4,800 collisions - this represents 25% of all collisions despite young drivers only representing around 7% of licence holders. According to the World Health Organisation road traffic collisions are the single biggest cause of death for young people (Aged 15 - 29 years) worldwide. Many young drivers will have a collision within the first six months of passing their test (RAC Foundation, 2014). All of these statistics show that it is vital that as many young people as possible get to hear the life saving messages from Learn2Live. Watch this short video to hear from students, teachers and road safety professionals about why it is essential that all sixth form students in Devon and Cornwall attend a Learn2Live presentation. Schools and colleges wishing to find out more about Learn2Live and support their students before and after the events can download our free 'Learn2Live Booklet' by clicking on the link in the top right hand corner. Road safety is an important issue with young people. For 16 and 17 years olds upwards they are starting to move away from parental control, making choices about their futures and are more in ‘control’ of their lives. Socialising is important and there is increasing peer group pressure. Risk taking and thrill seeking play a bigger part in their lives and in some cases, so does expose to criminality. It is likely that the students will have received some road safety education at primary school, but this is often learning about rules and may not have involved students assessing risk and considering consequences of their actions. By including road safety in the curriculum, there is opportunity for the students to develop the necessary skills to make sensible, safe choices and enhance their personal development and safety. As you will know road safety is not specifically included in the curriculum and although as a topic it readily fits in with citizenship and PHSE, it often becomes squeezed out by more popular topics. As a non-examinable subject the time afforded can be extremely constrained within the time table. Education for citizenship equips young people with the knowledge, skills and understanding to play an effective role in public life. Citizenship encourages them to take an interest in topical and controversial issues and to engage in discussion and debate. Students learn about their rights, responsibilities, duties and freedoms, and about laws and justice. They learn to take part in decision making and different forms of action. They play an active role in the life of their schools / colleges, neighbourhoods, communities and the wider society. From exploring citizenship they are able to evaluate information, make informed judgements and reflect on the consequences of their actions now and in the future. Students can find the Learn2Live road safety presentations hard hitting. Whilst no graphic imagery is shown during the films and it is not the intention to upset audience members, road safety can be a sensitive issue and the content could be emotionally challenging for some. It is important that schools and colleges check whether any students have been affected by serious road traffic collisions in the past. In some instances it may not be appropriate for students to attend the event. Schools and colleges should ensure that there is professional emotional support on hand for audience members both during and after the main Learn2Live events and that students are aware of the support and counselling services available through your school/college. We strongly advise that all parents are sent a letter informing them of the intention for their child to attend the Learn2Live event. A template letter to parents is available at the top of this page. Schools and colleges should familiarise themselves with the Learn2Live Event Risk Assessment Form which is available at the top of this page. Members from Road User Support Service (RUSS) will be on hand at the main Learn2Live events. RUSS is a unique organisation based in the South West that helps people who are dealing with emotional problems and trauma following a road traffic incident. 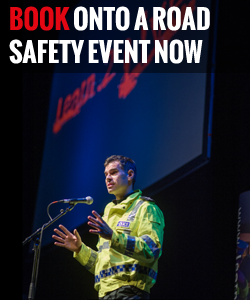 Learn2Live have developed two short PowerPoint presentations that schools and colleges are encouraged to share with students both before and after attending the main Learn2Live road safety events. The 'Pre-event presentation' sets the scene and explains what students can expect from the theatre event. This provides a opportunity for teachers to introduce and explain the concept of SAFE PLANS as well as checking about the suitability for students to attend if they have closed personal experience of the impact of road traffic collisions. A 'Post-event Powerpoint presentation' reminds students about the salient road safety messages explained during the theatre presentation. Teachers can also use the presentation to reinforce and further explore SAFE plans with opportunities for students to think about how they would address a number of risky in-car scenarios. Both presentations can be downloaded using the links in the top right-hand corner of this page.